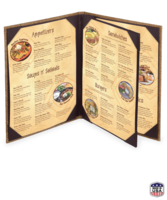 Bring an exotic, tropical Caribbean feel to your restaurant with caribe basketweave menu covers. The durable, fashionable basketweave material give these menu covers a sophisticated, fun, and unique style that your guests will notice. Show your guests you take pride in your restaurant’s dining experience right down to the smallest details. 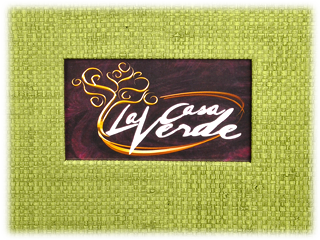 Caribe basketweave menu covers are made with highly sustainable woven fiber material available in eight earthy colors. Imitation leather photo album corners in complimentary colors hold full menu sheets firmly in place. You can display your full color logo or restaurant name inside a picture window on the front of your basketweave menu cover to introduce yourself to guests. These menu covers create a relaxing, vacation-like feel in your restaurant with soothing texture, thoughtful accents, and simple colors. Restaurants with a light and relaxed ambiance will benefit from including basketweave menu covers in their dining experience. The tropical beach feel of basketweave material will entice guests into a pleasant mood as if they’re on vacation. 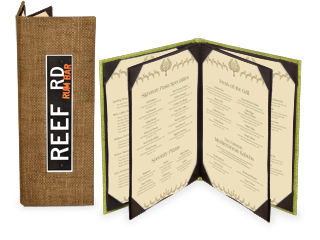 Basketweave menu covers are tough and durable, even in a chaotic restaurant environment. Their average lifespan is five years or more. Wipe the menu covers clean with a water-dampened cloth, and use a drop of mild dishwashing liquid only as necessary. Basketweave menu covers can be made to suit your needs and style. Sizes start at 5.5 in. X 8.5 in. and increase up to 8.5 in. X 14 in., with custom sizes available in between and beyond. Choose from a variety of menu page lengths including single, double, four-view, and six-view options. 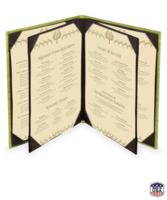 Basketweave menu covers are only available in natural, earth tone colors. Options include olive grove, bison, tawny gold, bryce canyon, earth tone, fennel, tatami, and thatch. 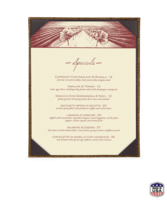 Caribe basketweave menu covers add a soothing atmosphere to your establishment’s dining experience. 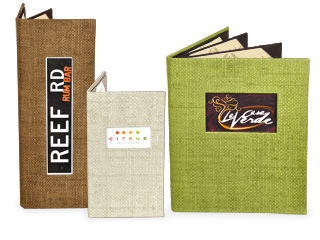 An investment in their durable, unique texture and inviting appeal is sure to enhance your restaurant’s own style and brand. This classic menu cover option endure through various cuisine updates and restaurant transformations. 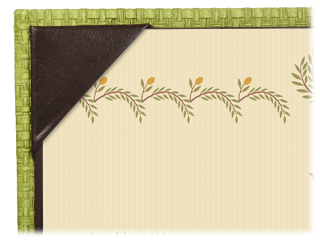 Looking for menu paper to fit these menus covers? Check out our library of designs printed on a selection of weighted paper. 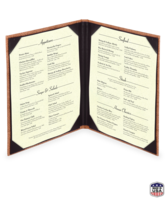 Lighten the mood and soothe your guests with these woven fiber, caribe basketweave menu covers for a sustainable menu cover option from Menu Shoppe.